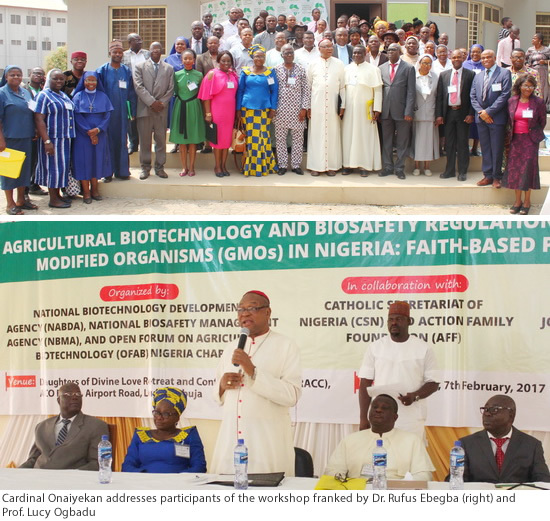 John Cardinal Onaiyekan, the Archbishop of the Catholic Archdiocese of Abuja, Nigeria, together with other church leaders have called on agricultural biotechnology experts to undertake research that is focused on the population's agricultural challenges. The leaders met with agri-biotech researchers, regulators, and communicators at Daughters of Divine Love Retreat and Conference Centre (DRACC) Lugbe, Abuja on February 7, 2017. The Director General, National Biotechnology Development Agency (NABDA), Prof. Lucy Ogbadu who gave an overview on the global status of GM crops, explained the need to create access to this technology for farmers. "The position of the Catholic Church is to leave scientists to do their research, but we are also constantly looking at what comes out of it in the light of the will of God and what is good for human beings," said Cardinal Onaiyekan. He further said that safe use of the technology is the church's utmost priority. Dr. Rufus Ebegba, the Director General of Nigeria National Biosafety Management Agency (NBMA) reassured the faith-based leaders that the Agency is diligently doing its job in ensuring GM technology is well regulated. The agency was created following the ratification of Nigeria's Biosafety Management Act in 2015, which ensures safety application of modern biotechnology. Prof. Mohammed Ishiyaku, the Bt cowpea project principal investigator, made a presentation on the need to develop Bt cowpea, one of the key biotech crops under research in Nigeria. The project addresses one of the most damaging pests that poses threat to millions of Nigerians who rely on the crop for food security. Cardinal Onaiyekan was accompanied by priests, nuns, and Catholic medical professionals in the event that was organized by the Open Forum on Agricultural Biotechnology (OFAB) in Africa, Nigeria Chapter in collaboration with the Catholic Secretariat of Nigeria (CNS) and the Action Family Foundation (AFF). For more information on the event and biotechnology developments in Nigeria, contact Dr. Rose Gidado, OFAB-Nigeria Coordinator at roxydado91@gmail.com.